My life has been shaped by some pretty significant events. But, some of my greatest lessons came from seemingly meaningless moments. One of them happened my sophomore year of high school. I was a kid growing up in the country, but attending Jesuit High School in New Orleans. Jesuit High alumni include some of the wealthiest and influential people in the New Orleans area, so I was very much out of my natural element. I was invited over to a friend’s house to play tennis after school. (Yes, they had tennis courts in their back yard). We had played a couple of sets and needed a break, so we went into the house to get a drink. The kitchen was beautiful, and unlike any I had ever seen. The water cooler had been inset into an oak cabinet so that all you saw was the bottled water dispenser spout coming out of an incredibly ornate oak cabinet. I grabbed a glass, put it under the spout, and pressed the lever to fill my glass with water. I was taken aback to see red fluid flowing into my glass, which caused me to stop immediately and start asking questions. As simple as that… and it made absolute perfect sense. What else could come out, except what they put into it? A light bulb went off for me. This was a very obvious, yet profound lesson. 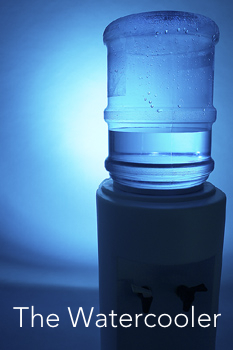 I am no different …correction… WE, are no different from that water cooler. What comes out of us is what we put into us. Love, hate, gratitude, respect, anger, peace etc… all come from what we put into our hearts and minds. 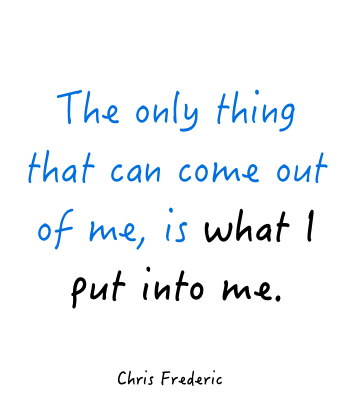 The only thing that can come out of me, is what I put into me. What people to I associate with? These are all of the things I am putting into my water cooler. To put Red Gatorade into my water cooler, and then expect water to come out of it… well, that is simply irrational. Yet we do it every day with our minds and rarely recognize it. It’s the irrational game that we sometimes play. As I move forward, I try to make conscious choices every day to create the conditions for future success and growth. If you are subscribed to this blog, then chances are that you are doing the same. Thanks Chris for the compliment. And for writing. You have a gift! Great insights Chris! We are all products of our environment and the choices we make each day.